Click here for a link to the PDF version. It is well established that the classic GTP switch mechanism determines the “on” (GTP-bound) and “off” (GDP-bound) state of small GTPases. Additionally, there is mounting evidence that additional direct, dynamic modifications of GTPases may modulate their function in signal transduction processes. Several reports indicated that GTPases, including Ras1 and Cdc422, are directly modified by tyrosyl phosphorylation (pY) in response to external stimuli such as epidermal growth factor (EGF). 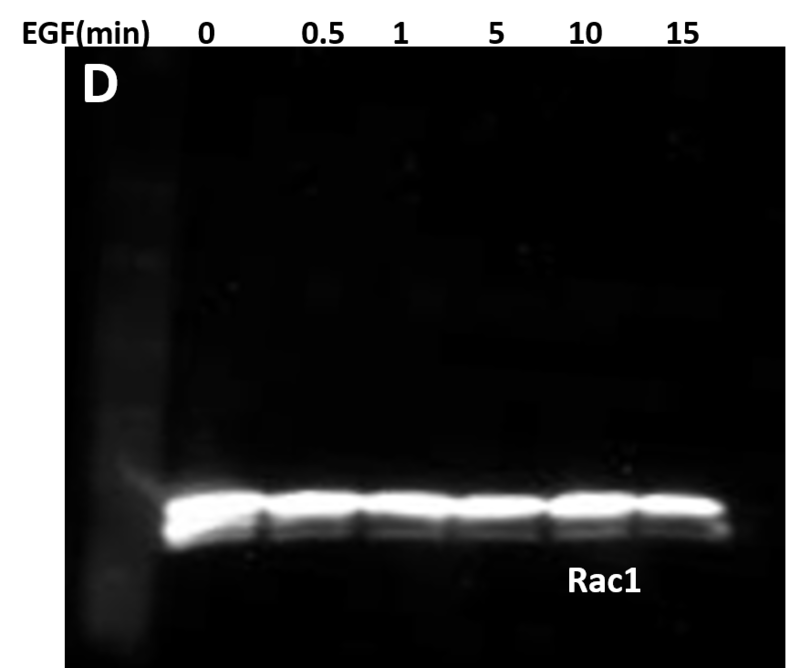 Another study demonstrated that Y64 in Rac1 is regulated by Src and FAK in vitro3. These studies suggest that pY modification may regulate the interaction of GTPases with downstream signaling proteins. However, these findings were generated largely through transfection experiments; thus, in most cases endogenous relevance remains to be determined. Identifying endogenous protein modifications during signal transduction is challenging as the signal is often extremely transient and only a small percent of the signaling protein is modified during any given signaling event. 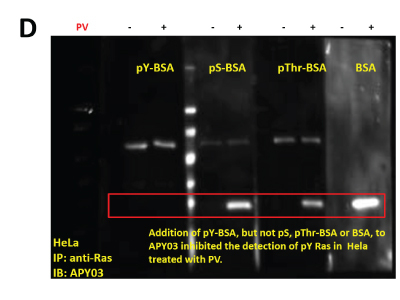 We have recently generated a high affinity mouse monoclonal anti-pY antibody (APY03) which is highly specific to pY and will not cross-react with phosphoserine (pS) or phosphothreonine (pThr) as shown in Figure 1. 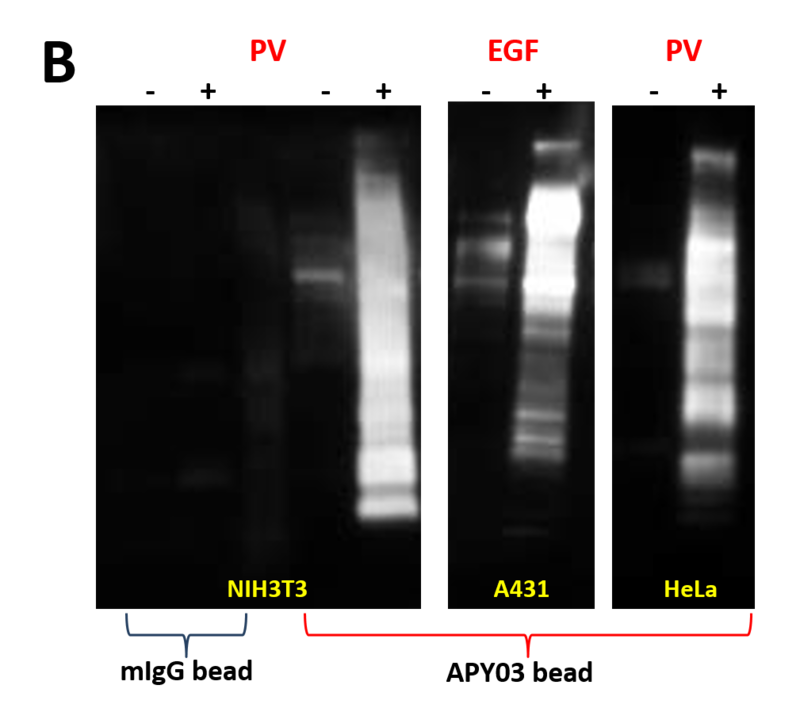 APY03 demonstrates strong detection of pY proteins in both immunoblotting (IB) and immunofluorescence (IF) applications (Figure 2a and 2c). For immunoprecipitation (IP) experiments, APY03 was first covalently conjugated to protein G beads in order to minimize the co-elution of heavy and light chains of the antibody, which can often interfere with immunoblot analysis. 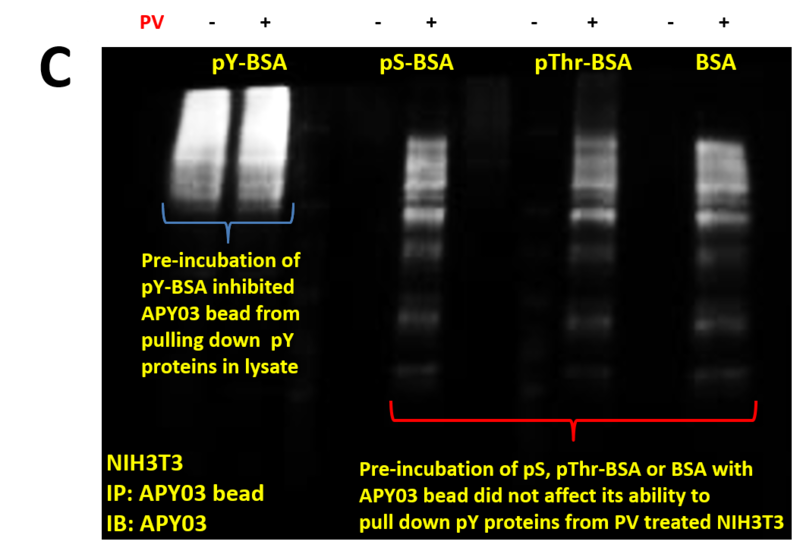 Figure 2b shows that APY03 beads can immunoprecipitate a wide range of pY proteins in lysates prepared from cells treated with either EGF or pervanadate (PV). The aim of this study was to develop an assay sensitive enough to detect endogenous pY-modified Rac1 upon stimulation by EGF. The IP assay was used in conjunction with a Rac1 activation assay to follow temporal changes in endogenous Rac1 activation and tyrosyl phosphorylation in response to EGF stimulation of HeLa and A431 cells. Rac1 activation, monitored by PAK-binding, followed a predicted time course in which activation peaked, within 30 seconds in HeLa and 1 minute in A431 after EGF stimulation, and thereafter decreased to basal level. Conversely, pY Rac1 levels decreased to minimum at 30 seconds in HeLa and 1 minute in A431 post stimulation before returning to basal levels. To our knowledge, these data represent the first demonstration that endogenous Rac1 is a target for transient modification by a tyrosine kinase, and possibly a phosphatase. Furthermore, these results support transfection data suggesting that Rac1 can be modified by Src and FAK tyrosine kinases. 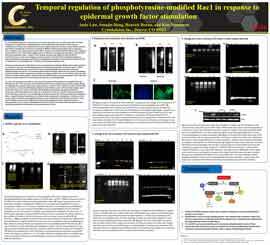 Future work will utilize the IP assay to elucidate the temporal relationship between Rac1 activation and tyrosyl phosphorylation under a variety of physiological stimuli and to define the identity of the endogenous tyrosine kinase(s)/phosphatase(s) that regulate tyrosyl phosphorylation of Rac1. 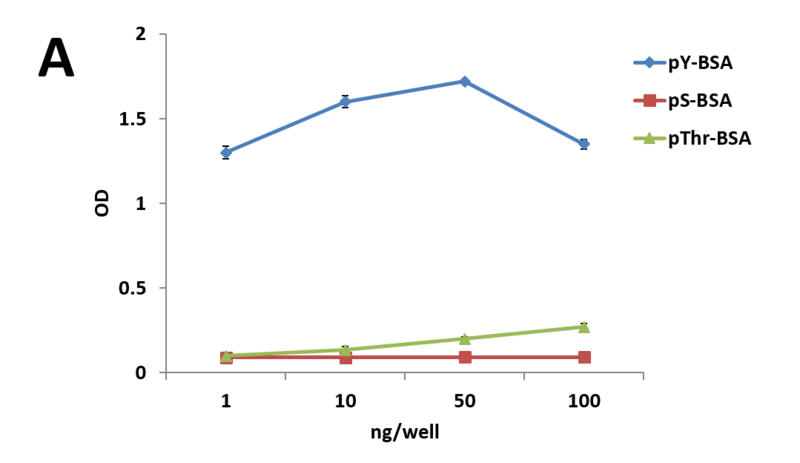 (A) Phosphopetides (pY, pS and pThr) were conjugated to BSA, and increasing amounts of phosphopeptide-BSA were added serially to an ELISA plate. APY03 (1:5000) and goat anti-mouse (1:5000) were used to detect phosphopeptide-BSA in wells. (B) 20μg of cell lysate from cells either left untreated or treated with 100 μM of H2O2 activated pervanadate(PV), a tyrosine phosphatase inhibitor, for 10 minutes or 50nM of calyculin A, a serine/threonine phosphatase inhibitor, for 1 hour were resolved by SDS-PAGE and immunoblotted(IB) with the indicated antibodies (anti-pS and anti-pThr antibodies were obtained from Millipore). 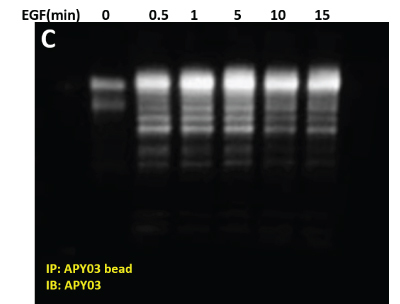 (C) 30 μl slurry of APY03 beads, equivalent to 10 μg of APY03 antibody, was first incubated with 50 μg of either pY-BSA, pS-BSA, pThr-BSA or BSA for 30 minutes and then washed 3 times to define APY03 specificity. 300 μg of lysate from NIH3T3 cells either left untreated or treated with 100 μM of PV were pulled down using the APY03 beads that were pre-incubated with phosphopeptide-BSA or BSA. Westerns were performed and samples were immunoblotted with APY03 antibody. (D) 1 mg of lysates from HeLa cells either left untreated or treated with PV were pulled down using 5mg of anti-Ras antibody bound to 10 μl of protein G beads. Pull down proteins were resolved in SDS-PAGE and transferred to a PVDF membrane. Immunoblotting was conducted using APY03 mixed with 10 μg/ml of either pY-, pS-, pThr-BSA or BSA only. CleanBlot (Thermo Scientific) was used as secondary antibody to avoid the detection of heavy and light chains coming off the beads during elution. (A) 20 μg of lysate from cells either left untreated or treated with EGF (50 ng/ml for 5 minutes) or PV (100 μM for 15-30 minutes) were resolved by SDS-PAGE and immunoblotted with APY03. (B) Immunoprecipitation of pY proteins was performed by incubating equal amount of lysate from untreated or treated (PV or EGF) cells with APY03 beads or mouse IgG (mIgG) beads. Samples were resolved by SDS-PAGE and immunoblotted with APY03 antibody. (C) Both NIH3T3 and A431 cells were plated on glass cover slips prior to treatment. Untreated or PV treated (100 μM for 10 minutes) NIH3T3 cells were fixed in acetone/methanol prior to staining. Serum restricted A431 cells were either untreated or EGF treated (50ng/ml for 5 minutes) prior to fixation and staining. Nuclei were stained with DAPI (blue) and pY signals (green) were detected with APY03 and Alexa Fluor 555 goat anti-mouse antibodies. (A) Serum starved HeLa cells were either left untreated or treated with EGF (50ng/ml) for specific times as indicated. Cells were lysed in RIPA buffer. APY03 beads were used to immunoprecipitate pY proteins from 1mg of total cell lysate from each condition. 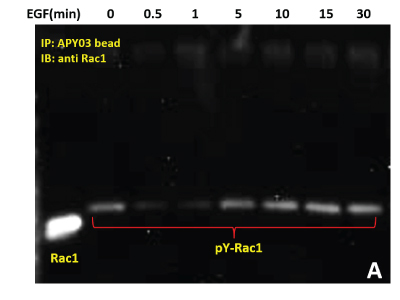 Samples were resolved by SDS-PAGE and immunoblotted with anti-Rac1 antibody to detect tyrosyl phosphorylated-Rac1 from the immunoprecipitated pY protein population. 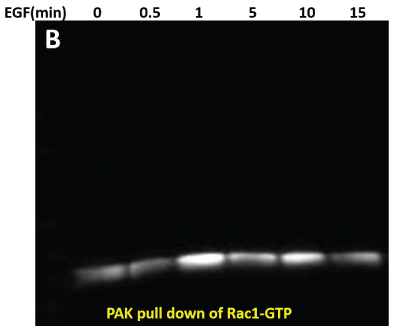 (B) 600 μg of the same HeLa lysate was used in PAK pull down of Rac1-GTP to measure active Rac1. 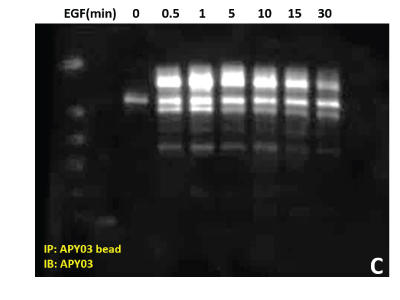 (C) Total pY proteins from HeLa cells treated with EGF were enriched using APY03 bead immunoprecipitation. 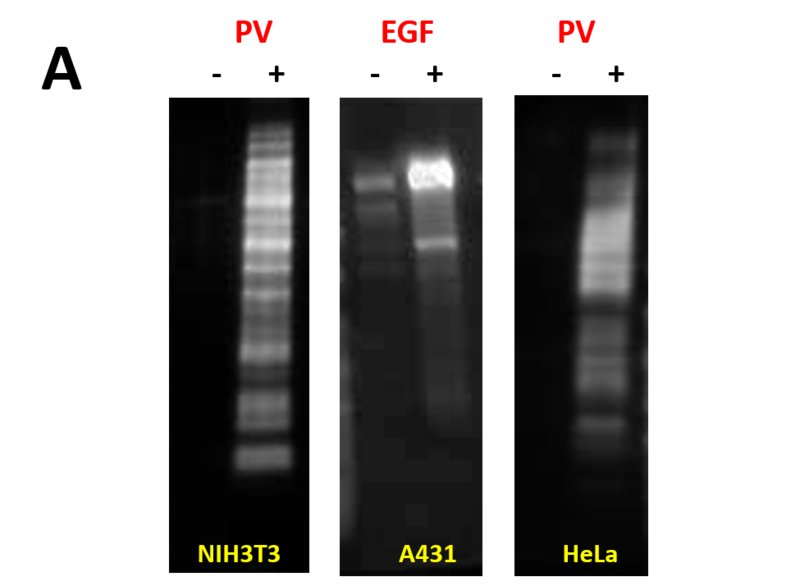 Samples were resolved by SDS-PAGE and total pY was detected with APY03 antibody. (D) 10 μg of the Hela lysate were resolved by SDS-PAGE and immunoblotted with anti-tubulin and anti-Rac1 antibodies. (A) Serum starved A431cells were either left untreated or treated with EGF (50ng/ml) for the indicated times. Cells were lysed in RIPA buffer. APY03 beads were used to immunoprecipitate pY proteins from 1mg of total cell lysate from each condition. Samples were resolved by SDS-PAGE and immunoblotted with anti-Rac1 antibody to detect tyrosyl phosphorylated-Rac1 from the immunoprecipitated pY protein population. (B) 600 μg of the same A431 lysate were used in PAK pull down of Rac1-GTP to measure active Rac1. (C) Total pY proteins from A431 cells treated with EGF were enriched using APY03 bead immunoprecipitation. 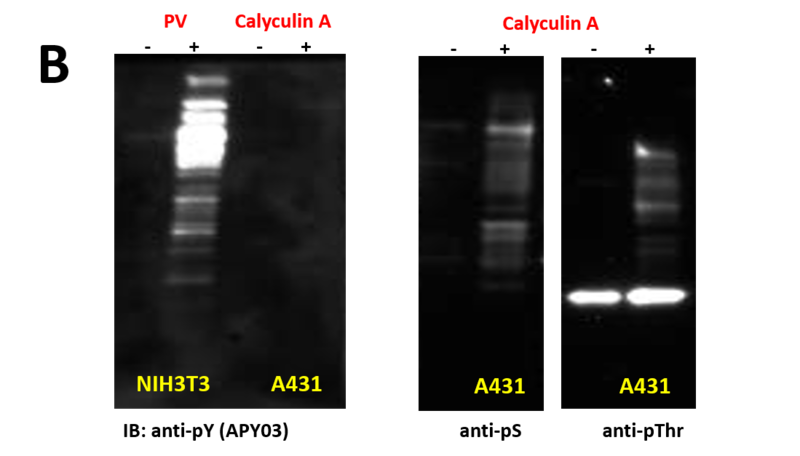 Samples were resolved by SDS-PAGE and total pY was detected with APY03 antibody. (D) 10 μg of the same A431 lysate was resolved by SDS-PAGE and immunoblotted with anti-Rac1 antibody. (E) Serum starved A431 cells were left untreated or treated with either 30 μM of Src inhibitor (PP2) for 30 minutes or 10 μM of FAK inhibitor (PF228) for 1 hour before EGF treatment. Cells were lysed in RIPA buffer. APY03 beads were used to immunoprecipitate pY proteins from 1mg of total cell lysate from each condition. 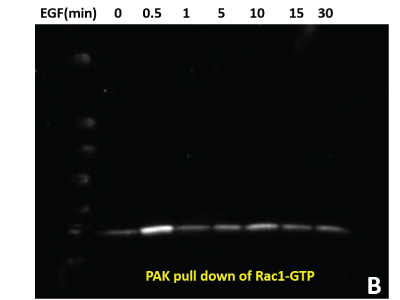 Samples were resolved by SDS-PAGE and immunoblotted with anti-Rac1 antibody to detect phosphorylated-Rac1 from the immunoprecipitated pY protein population. 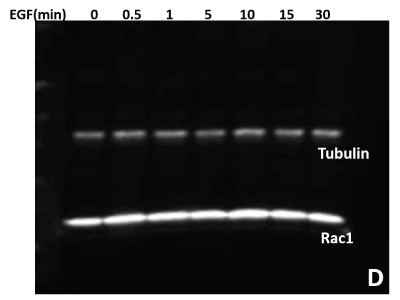 10 μg of the same lysate were resolved by SDS-PAGE and total Rac1 was detected using anti-Rac1 antibody. 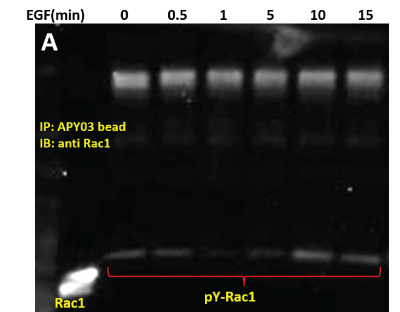 APY03 and APY03 beads are useful tools to detect endogenous tyrosyl phosphorylated proteins such as Rac1. Modifications such as tyrosyl phosphorylation may modulate Rac1 activation status and activity; importantly, our data demonstrate the significance of identifying and defining the interplay between protein modifications. 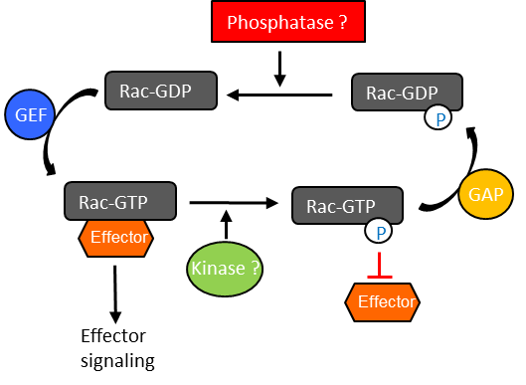 Src and FAK may be essential kinases for the tyrosyl phosphorylation status of Rac1. Future work will utilize the IP assay to elucidate the temporal relationship between Rac1 activation and tyrosyl phosphorylation under a variety of physiological stimuli.